The Nor'easter has arrived in the Adirondacks. The roads are rather slippery and treacherous as the heavy snow and high winds make visibility a challenge. It was really wild to ski at Mt. Van Hoevenberg on the Porter Mountain trails. The wind was gusting over 40 miles an hour, and the trees were swaying ominously. The cacophony of the wind in the trees, and those same trees creaking and squeaking, was overwhelming. It was tough to hear the person next to me speaking. It is time to hunker down with my mochaccino and watch the snow pile up. 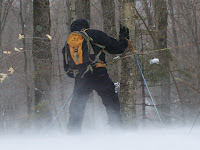 As I hunker down, batten down the hatches and welcome the most honored winter visitor, Nor'easter, I'll relay some information about backcountry ski conditions (lite) in the Adirondacks. 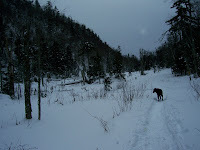 The Jackrabbit Trail from Lake Placid to Keene, New York via the pass between Pitchoff Mountain and the Sentinel Range of the Adirondacks, is in great shape. Surprise. Puz, resident ski dog helped the Resident Biologist do a reconnaissance mission yesterday afternoon. The trail was nicely packed out with plenty of powder on the side for those (weenies) who turn to check their speed. Chimney Hill is completely covered, and safe for cutting it loose and catching a little air. This, claims the RB, is "tough on the knees." It's fun though! The pass features two ponds, cliffs and many ice climbers this time of year. The ice climbers are at it already, which seems early to me. But, then again, ice climbing is something I never understood. 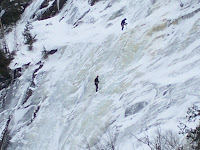 However, I understand ice climbing in the Adirondacks is quite good; people come from all over the world to climb here. Here is a link to more photos of the ski and ice climbers. By the way, we have been enjoying Fall Skiing here in the Adirondacks for more than a month. It is technically still Fall you know, since the first day of winter is next Saturday. Wow.